Today is the release of the prequel novella PROXY, which takes place before AVALON, which releases January 21, 2014. Most of the time these little novellas aren't a huge deal but this book, it's pitched as "a great match for fan's of Joss Whedon's "ult hit show Firefly". And if you're me you can't pass that up. So despite the fact that I have an ARC of AVALON I've waited patiently for this little novella to come out so I can dive head-first into the universe of the story. Mindee is hosting a giveaway in honor of this novella release, and I'm here to share a snippet of it for free. If you love it, or even just like it, you can splurge and spend .99 on it so you can read the whole 90 pages! If you need something stolen from any star system in the Confederation, you need look no further than the Shades. Jeth Seagrave and his band of teenage mercenaries have been making a name for themselves for being able to steal anything—and for disappearing before anyone is the wiser. Their latest job, a jewel heist on Grakkus, should be no different. But when Jeth's boss replaces a key member of his crew just before takeoff, and Jeth discovers a betrayal within his own ranks, he begins to suspect that not everyone is going to be coming back from his job alive. 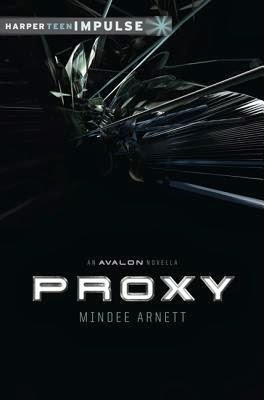 Proxy is an action-packed introduction to a world like nothing readers have seen before. The thrill of the job never got old. Jeth Seagrave lived for it. For the way the anticipation sent electricity pulsing through his veins, making his blood burn hotter, his heart beat harder, and sharpening his senses until he felt like something more than human. A superhero from one of the ancient myths of First Earth, perhaps. You’re no hero. The automatic thought skidded through his mind, barely registering. No, he wasn’t. He was a thief. One of the best. And that was all that mattered. Never mind that he was only sixteen. Never mind that most of his crew was even younger. Together they were an unstoppable force, a gang of teenage thieves their adult marks never saw coming. The thrill pulsed harder inside him, and with an effort he focused on the nav monitor in front of him. They would be entering the patrolled zone around the planet Grakkus soon. To his left, Celeste piloted the Debonair forward, her hands steady on the control column. Jeth would’ve preferred to pilot this job—he would prefer to pilot every job—but he and Celeste took turns. All of the members of the Malleus Shades held specific roles that played to their strengths. Celeste’s forte was counterintelligence, particularly the art of distracting marks. Jeth’s was strategy, and he typically took point on every job. But when it came to piloting, he and Celeste were equally matched. Jeth drew a breath, still struggling to focus. He couldn’t help it. The upcoming job was the most challenging, complicated one they’d taken on yet. The target was located in a vault at the top of a tower only accessible through the emperor of Grakkus’s personal bedchambers—not some insignificant politician or petty crime lord, but an emperor. Pulling it off would be like flying a spaceship through a solar storm without getting fried. A grin threatened to break on his face. The job was going to be fun, and with a payout well worth the risk. At last the nav computer flashed an indicator that they were heading into the patrolled zone. “I’m thinking about it.” A part of him didn’t want to. The so-called stealth drive was brand new and untested, at least by the Shades. If it didn’t work, things were going to get a whole lot more interesting real quick. And if it did work, well, then things weren’t going to get interesting. He couldn’t decide which he preferred. In the end, Celeste made the decision for him, reaching over to a switch on a sleek new section of the control panel. Jeth sighed. It was the right thing to do, of course, and there would be plenty of risks to be had once they landed. Or it might not work properly, he thought, examining the nav monitor once more. Best not to blindly trust some newfangled technology. Within minutes he spotted a blimp on the monitor, a patrol to their starboard. The ship was far off, but within range to scan them. “What should I do?” A hint of panic colored Celeste’s voice. They had never before flown so boldly through a patrolled area. “Hold course,” Jeth said, not taking his eyes off the blimp. So far the patrol ship hadn’t given any sign that it had spotted them. “Right.” Celeste tightened her grip on the controls. According to the instructions they’d received from their employer, who owned the Debonair, the stealth drive worked best when the ship maintained a constant speed and course. Any sharp turns or drastic acceleration or deceleration could turn up on a system scanning for thruster signatures, stealth drive or no. They passed out of range of the patrol a few minutes later, and Jeth sat back in the copilot’s chair, folding his arms across his chest as he tried to ignore his disappointment. They flew within range of three more patrols but moved past them without incident, finally breaching Grakkus’s atmosphere. Once through, Celeste headed for their rendezvous point, an isolated forested area a few hundred kilometers outside of the capital city. Beyond the bridge’s main windows, the first rays of sunlight were breasting the horizon, heralded by a swath of purple, pink, and vermillion. At last Celeste set the Debonair down on a large stretch of tall grass the color of seaweed. She powered off the engines and turned on the auxiliary, which would keep the shipboard systems running, including the stealth drive. It wasn’t likely that anyone would spot them out here—the place was well off the main thoroughfares, not to mention how inhospitable the swamp surrounding them was—but Jeth decided not to point that out. Jeth checked his watch, which he’d synced to Grakkus time. “I say breakfast or lunch, whichever works, and then a couple hours’ R and R. The setup man’s not due to arrive until fourteen hundred.” They’d had to get here early to avoid being detected during landing. The stealth drive hid them from sight, but it couldn’t disguise the sound of the engines or the wind raised by the thrusters. “Think I’m going to shower again, before—” Celeste broke off as a voice echoed over the ship’s comm system. Jeth blinked, all his disappointment from their unadventurous journey vanishing in the space of a single breath. It wasn’t often that Will Shady sounded nervous. Wondering if maybe the ship was on fire, Jeth turned and headed off the bridge with Celeste quick on his heels. They arrived in the common room on the deck below moments later. Jeth stopped in the doorway, surveying the scene. There wasn’t a fire. There wasn’t anything amiss at all, as far as he could tell. Shady was sitting on one of the sofas, his attention focused on the 3D projection from his portable gaming system, a wave of bloodthirsty robots coming at him, each one falling to his simulated gunfire. The comm unit he’d used to radio the bridge sat discarded on the sofa beside him, in danger of being swallowed by a cushion. “Practicing,” Shady said, not looking up. The scowl on his face as he let off a triple blast, drilling a robot right between its bulbous black eyes, made his features look distinctly leonine, the appearance aided by his shaggy mane of blond hair. Shady’s assigned role in the Malleus Shades was ordnance officer. Jeth arched an eyebrow. He considered pressing Shady for more, but knew there wasn’t much point. All the crew dealt with prejob nerves in different ways, and once engrossed in his ritual video game, it was hard to get Shady to concern himself with anything else. Jeth crossed the floor to the locker in question, wondering where the Debonair had been last. Their employer used the ship for lots of different jobs, and it was possible it had been parked planetside somewhere a wild animal could’ve gotten in. An image of something furry and clawed and with teeth the size of fingers flashed through Jeth’s mind. He wasn’t wearing a gun, and he briefly considered getting one before finding out what had Shady so nervous, but then he shrugged and pulled the door open. There was something alive in there all right, but it wasn’t a wild animal. Even still, it took Jeth several moments to come to grip with what it was. Who it was. You guys, this sounds like the start of something SUPER awesome and I can't wait to dig in. I don't know about you but I'll be buying this for my nook and reading it ASAP. And be sure to check out the Goodreads page for Avalon and then maybe pre-order it from B&N or Amazon. Now make sure you enter the giveaway because those prizes are super cool! And here's a little bit about Mindee if you were curious! Mindee Arnett lives on a horse farm in Ohio with her husband, two kids, a couple of dogs, and an inappropriate number of cats. She’s addicted to jumping horses and telling tales of magic, the macabre, and outer space. She has far more dreams than nightmares. She's the YA author of The Nightmare Affair (Tor Teen), an urban fantasy series about a girl who is literally a nightmare and must use her skills to solve a murder, and the forthcoming science fiction series, Avalon (B+B, 1/21/2014), where Jeth and his teenage mercenaries need to pull off one last big job in order to earn their freedom.